For centuries, the Aztecs of central and southern Mexico cultivated cocoa beans—the seeds ofTheobroma cacao. They believed that the cacao tree originated from a divine source—the wise god Tula Quetzalcoatl—who brought its seeds to cultivate in his garden here on Earth. Tula's mythological legacy has since become an important cash crop in the tropics of Central and South America, Asia, and Africa that is critical to the profitability of the multibillion-dollar U.S. chocolate industry. But cacao cultivation in Central and South America is threatened by two major diseases. During the past decade, Brazil's main production area in the state of Bahia has been devastated by a fungal disease called Crinipellis perniciosa, or witches' broom. The fungus penetrates stem and fruit tissue, inhibits pod formation, and destroys a tree's mature pods. In only 12 years, Brazil, which used to export about $100 million worth of cocoa beans to the United States every year, has gone from being the world's third largest exporter of cocoa beans to a net importer of beans. Globally, all major cocoa bean-producing regions are facing serious disease and pest problems. 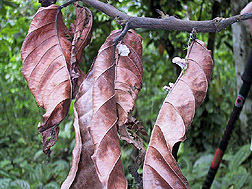 Another fungal disease, monilia pod rot (frosty pod rot), has forced abandonment of many cacao farms in Ecuador, Colombia, and Costa Rica. A new species of black pod caused byPhytophthora megakarya has the potential to cause severe losses in West Africa's cacao production areas. West Africa currently supplies over 50 percent of the world's cacao. Witches' broom and monilia pod rot are found only in Central and South America, and the new species of black pod is restricted to Africa. If witches' broom and monilia become established in West Africa, the results would be devastating to world cocoa markets. 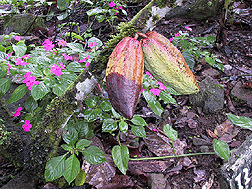 In an effort to help find ways to increase cacao's disease resistance, Agricultural Research Service scientists, led by plant geneticist Raymond J. Schnell, have signed a $500,000-per-year cooperative research and development agreement with Mars, Inc. Its goal is to develop a USDA-managed, internationally coordinated, genetic-marker-driven, cacao breeding-research program. This program will use a marker-assisted-selection (MAS) approach to select for new varieties with resistance to witches' broom, monilia pod rot, and black pod. Schnell is at the ARS Subtropical Horticulture Research Station (SHRS) in Miami, Florida. Researchers anticipate that MAS will be key to rapid development of disease resistance in the cacao tree. One of the principal applications of MAS is to allow breeders to identify disease- or insect-susceptible seedlings and eliminate them very early in the selection process. This allows subsequent progeny to be more intensively selected for other agronomic and complex inherited traits, such as those that interact with environmental factors. MAS has been especially helpful in tree crops, such as cacao, with long generation times. "Using traditional methods to breed cacao is a slow process, and most breeding programs have been based on a very narrow genetic base," says Schnell. "MAS could improve efficiency in breeding for quantitative and qualitative traits if molecular markers can be found that are linked to those traits." Molecular markers will also be used to genetically fingerprint all accessions in the major cacao germplasm collections in the Americas. This information will help broaden the genetic base to which researchers have access. 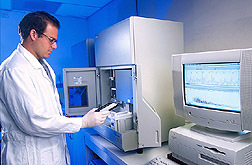 The fingerprinting takes place in the lab of James A. Saunders in Beltsville, Maryland. Researchers in Miami will then work toward identifying the genes involved in disease resistance reactions, using sophisticated techniques called expressed sequence tags and microarray technology. "We'll use these techniques to help us understand the molecular basis of resistance in cacao," says Schnell. "In the past, we weren't able to do this in such a comprehensive way." Researchers will be able to share the information they generate through establishment of a bioinformatics center, where computers will maintain a cacao genome database. Users will be able to cross-query other databases. ARS researchers have already identified several genes that may be involved with disease resistance in cacao. "Using a candidate gene approach, we have identified 75 resistant gene homologues (RGH) that can be placed into 11 different groups fromT. cacao," says Schnell. "In the model species,Arabidopsis thaliana, resistance genes are clustered. If this proves true for cacao, the RGH's provide us with a means to locate other resistance genes in the genome." The SHRS is part of the National Plant Germplasm System. Researchers there have developed molecular marker technology to fingerprint the collections of cacao, tropical fruit crops, and ornamental germplasm. Molecular markers are generated in several different ways, and it is customary to tailor the type of marker to the species and the situation. "We are currently using simple sequence repeat markers, also known as microsatellite markers. Newer, more precise markers are constantly being developed, as are improved methods for high-throughput and improved accuracy of genotyping," says Schnell. Collaborative projects have been established with scientists in Brazil, Costa Rica, Trinidad, Ecuador, and the United Kingdom, at institutes that traditionally work with cacao. "Using populations developed by collaborating scientists and segregating for resistance to witches' broom and frosty pod, we're producing genetic linkage maps using microsatellite markers. These linkage maps are similar to road maps and allow us to locate genes on each of the 10 chromosomes of cacao," says Schnell. Researchers hope that this unprecedented multinational effort to survey genetic diversity, identify the genes responsible for disease resistance, and develop new disease-resistant varieties will support and improve cacao production abroad, where disease has threatened to undermine this valuable commodity.—By Jesús García,formerly of ARS. This research is part of Plant, Microbial, and Insect Genetic Resources, Genomics, and Genetic Improvement, an ARS National Program (#301) described on the World Wide Web at http://www.nps.ars.usda.gov. Raymond J. Schnell is with the USDA-ARS Subtropical Horticulture Research Station, 13601 Old Cutler Rd., Miami, FL 33158; phone (305) 254-3611, fax (305) 238-9330. 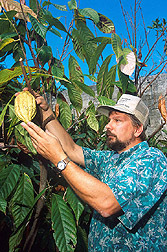 "Food of the Gods: Cacao and Marker-Assisted Selection" was published in the July 2001 issue of Agricultural Research magazine.